A German army officer who plotted to blow up Adolf Hitler and was executed along with the Catholic priest he confessed to will have his bravery medals put up for sale. Commander Ludwig von Leonrod was court-martialled and hanged in August 1944 following the unsuccessful attempt to blow up the evil Nazi dictator. The plot, codenamed Operation Valkyrie, involved members of the German military who were horrified by what their country had become under the Fuhrer. 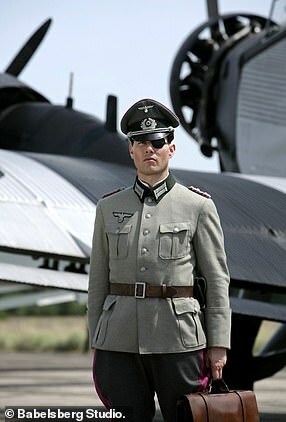 On July 20, 1944, one officer – Claus von Stauffenberg, played by Tom Cruise in the 2008 film Valkyrie – left a bomb under a table at a military conference Hitler was hosting at his Wolf’s Lair base in Poland. 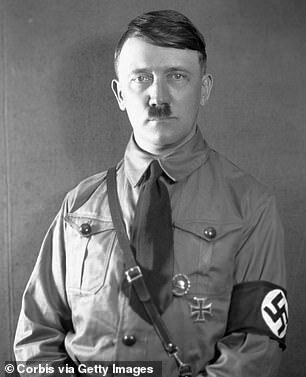 Although the device went off and killed four people, Hitler survived as only one of the small bombs in the brief case was armed. After von Stauffenberg placed the brief case under the conference table it was moved behind a solid oak table leg, which shielded Hitler from the blast. Nazi traitor, von Stauffenberg, lost his left eye, his right hand, and two fingers on his left hand during and air strike on German tanks in north Africa, which made his attempts to arm the bombs harder. 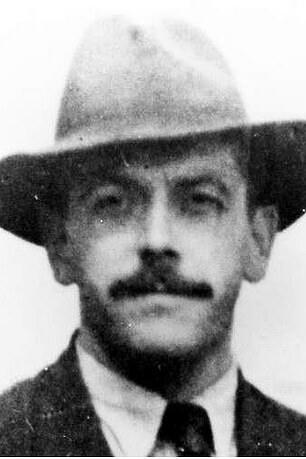 Von Leonrod was a liaison officer for the Nazi resistance unit but was not actively involved in the July 20 coup. But he had prior knowledge of the plot as his old friend, von Stauffenberg, had tried to get him to participate in the killing. On the day of the assassination attempt, von Ludwig was on a training course in Berlin and was arrested the next day by the Gestapo. But because the officer, who was a devout Catholic, had previously mentioned the plot in a confessional with a priest, he was found to have known about what von Stauffenberg was planning and so was executed. The priest who heard his confession was also executed for having knowledge of the scheme. 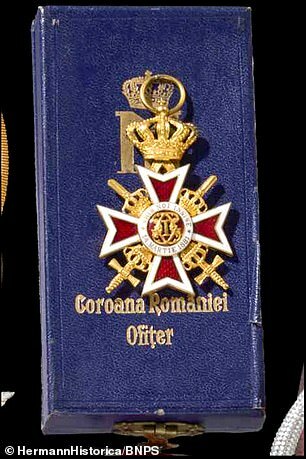 Von Leonrod’s military medals for bravery were given back to his relatives, a noble Bavarian family whose ancestors included Barons and Lord Chamberlains to Bavarian Kings. 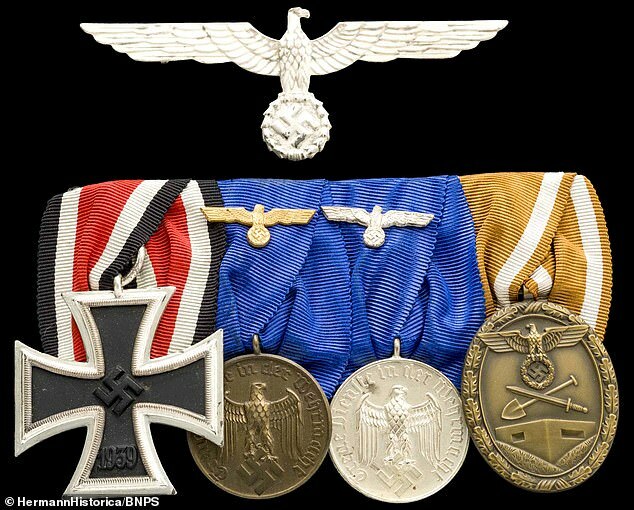 Von Leonrod’s medals, which include the Iron Cross and decorations for long service, are now being sold by German auction house Hermann Historica as part of the estate and archives of the von Leonrod family. A spokesman for Hermann Historica of Munich said: ‘Of rather tragic nature is the contribution of the last in the male line, Ludwig Freiherrn von Leonrod. 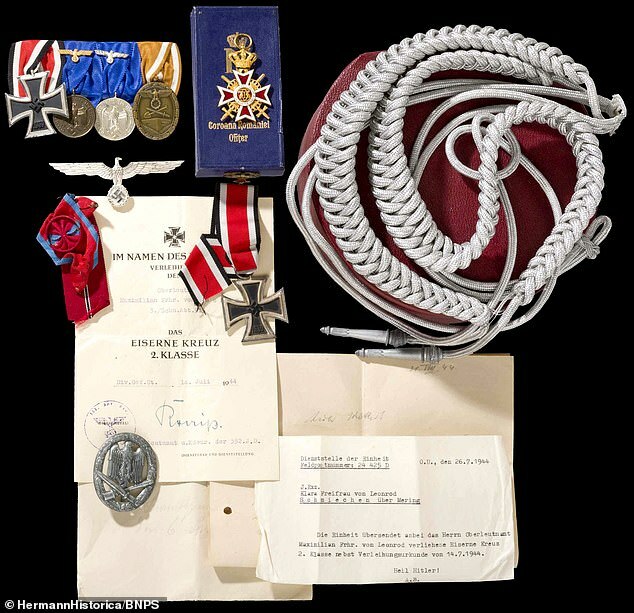 ‘A large batch of photographs and documents detailing the life of a nobleman, executed by his Nazi henchmen in 1944 as a conspirator to the failed assassination attempt on Adolf Hitler in July of the same year. ‘Hermann Historica is proud to offer the well documented but untouched family archives. The group includes a number of exceptionally rare awards that would assured grace any museum collection. Born in Munich in 1906, von Leonrod was the elder son of Lord Chamberlain Wilhelm Freiherr von Leonrod and his wife Clara. From 1926 he served in the 17th Cavalry Regiment Bamberg. The cavalry was composed of noblemen who were wealthy and had their own riding school. Von Stauffenberg served in the regiment which is how he came to know von Leonrod. He rose to the rank of major and was awarded the Iron Cross as commander of an intelligence unit in 1941. 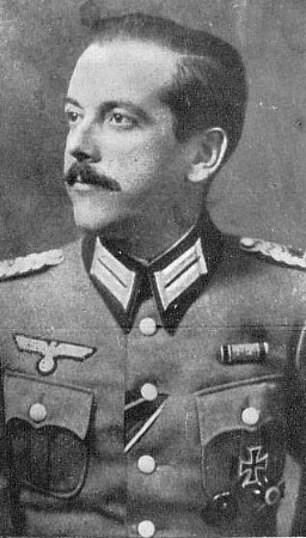 A year later von Leonrod was severely wounded by a landmine and was subsequently transferred to take command of military district VII in Munich. Colonel Count Claus von Stauffenberg was born in Stauffenberg castle into a noble family in what was then the Kingdom of Bavaria. 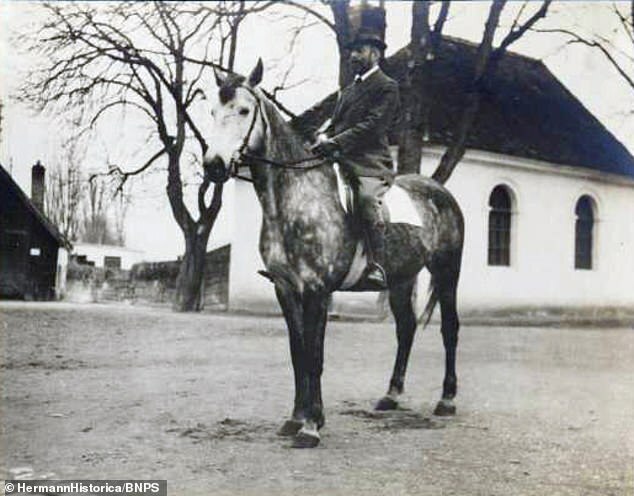 In 1926, he joined the family’s traditional regiment, the Kavallerieregiment (Cavalry Regiment 17). 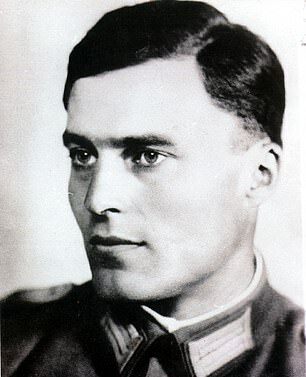 Although Stauffenberg agreed with the Nazi’s nationalistic and racist views and supported the German invasion of Poland, as well as making extremist remarks about Polish Jews, he never became a member of the party. As von Stauffenberg remained a staunch Catholic he switched between a strong dislike of Hitler’s racist policies and a respect for his military prowess. But von Stauffenberg became even more disaffected with the party after The Night of the Long Knives – in which Hitler purged the army of his rivals and Kristallnacht – which saw Jewish business vandalised and synagogues set on fire. To von Stauffenberg these incidents proved Hitler had no intentions of pursuing justice. He supported the invasion of Poland and, as many of the German aristocracy believed, he saw the eastern territories surrendered after World War I was rightfully belonging to Germany. After taking part in Operation Barbarossa in 1941, he went to Tunisia to fight in the Afrika Korps where he was directing tank units when an air strike took out his column of vehicles. Von Stauffenberg lost his left eye, his right hand, and two fingers on his left hand during the attack. After D-Day on June 6, 1944, he saw the war as lost and wanted Hitler to surrender to save Germany being damaged any further. But his plot to assassinate the Fuhrer failed when he only armed one of the two bombs in a brief case and the device was moved from being near Hitler and placed behind a solid oak table leg. Hitler suffered minor injuries including a perforated ear drum and von Stauffenberg and some of his co-conspirators were said to have been hanged with piano wire for treason. He was approached by von Stauffenberg to become the resistance’s liaison officer for the same district and was aged 37 when he was executed at Plotzensee Prison in Berlin. 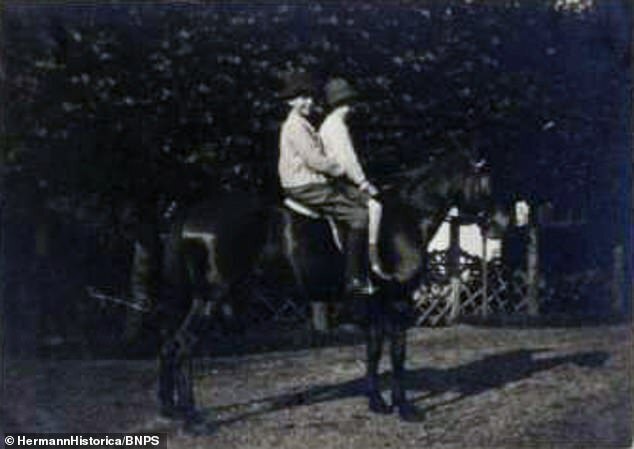 Both von Stauffenberg and his fellow conspirator, von Leonrod, served in the Cavalry Regiment 17. His medals are being sold for €1,000 on March 15.